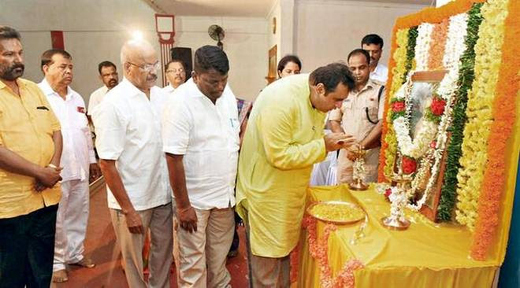 Udupi, Sep 7,2017:Speaking after inaugurating the Brahmashri Narayana Guru Jayanti celebrations organised by the District Administration, Zilla Panchayat and the Department of Kannada and Culture, at Udupi on Sept 6, Wednesday; Karnataka Minister for Fisheries, Youth Empowerment and Sports Pramod Madhwaraj said that the ideals of social reformer Narayana Guru were eternal and everybody should follow them. Minister Madhwaraj said that if all political parties followed the message of Narayana Guru, there would be no disharmony in the country. Narayana Guru had given the message of one caste, one creed, and one God. Narayana Guru had toiled for the uplift and welfare of the Dalits, the Backward Classes, and the oppressed. He had created conditions for social independence in the country, the Minister added. The State government was committed to the welfare of the Dalits and Backward Classes. It was constructing community hall for all Backward Classes. It had released Rs. 25 lakh each for the construction of community hall in Kadekar, Malpe, Havanje, Hoode, and Ambalpady. It was providing scholarships to students coming from weaker sections, Madhwraj said. Madhusudhan Bhat, Principal of Upendra Pai Memorial College, delivered a special lecture on the occasion. Dinakar Babu, President of the Zilla Panchayat, Nalin P. Rao, President of the Udupi Taluk Panchayat, Shilpa Suvarna, ZP member, Priyanka Mary Francis, Deputy Commissioner, and Sanjeev M. Patil, Superintendent of Police, were present on the occasion. Mahadevaiah, Assistant Director of Kannada and Culture, welcomed the gathering. Janardhan Tonse, Zilla Panchayat member, participated.